Just regular folks. : Cheese balls. Edda loves cheese balls. So perfectly round, so perfectly cheese-y, so perfectly yum. They also happen to come in an enormous jug. 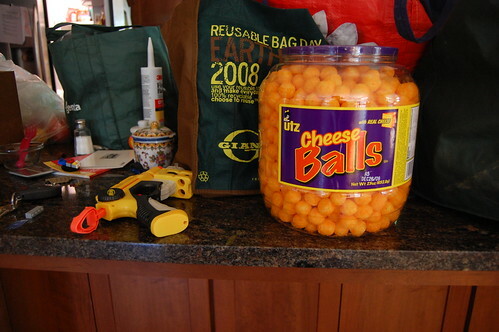 How are we going to get rid of a whole jug of cheese balls? One little cheese ball at a time, I suppose. MORE CHEESE BALSS FOR EDDA! Vince, Grandma heard that Edda doesn't like chocolate but like cheese balls instead before this posting of "Cheese balls. Therefore, I checked out on Amazon.comC It didn't have the free ship for UTZ cheese balls in a barrel. But, it is just like this one. Therefore, Grandma mailed out a letter to you this morning asking you to buy more Cheese balls for Edda. And you all can share with her. Vince, many thanks for your help. Oh, late last night, at home, Grandmom received a call from the PLANT. Asked her to show up one hour earlier [just an hour earlier :)] to fix problems with the installation of some piping of "Safety Injection System". So, this morning, grandmom left to work at 4:30 AM. THANK GOD amazon does not ship cheese balls for free! Otherwise I know we would be knee deep in cheese balls. :) Hope you guys are doing OK with the crazy schedule.